A puppy is a juvenile dog. 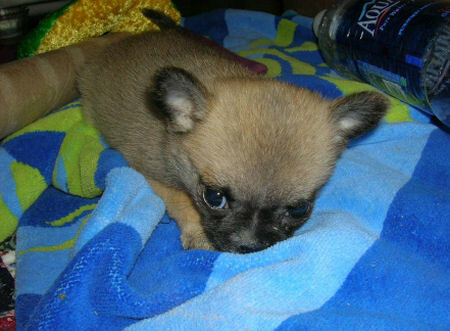 Some puppies may weigh 1–3 lb (0.45–1.4 kg), while larger ones can weigh up to 15–23 lb (6.8–10 kg). All healthy puppies grow quickly after birth. A puppy’s coat color may change as the puppy grows older, as is commonly seen in breeds such as the Yorkshire Terrier. In vernacular English, puppy refers specifically to dogs while pup may often be used for other mammals such as seals, giraffes, guinea pigs, or even rats. This entry was posted on September 21, 2012 at 11:04 pm, filed under Uncategorized. Bookmark the permalink. Follow any comments here with the RSS feed for this post. Both comments and trackbacks are currently closed.